Make succession sowings under glass of cucumbers, pumpkins and sweetcorn; also aubergines, tomatoes, peppers, salsify, French sorrel and Swiss chard. Continue sowing Brussels sprouts and cauliflower; sow main crop carrots, second early and main crop peas, beetroot, red and summer cabbage, leeks and turnips. In warm areas or sheltered gardens make a first sowing of French beans towards the end of April. Plant out globe artichoke suckers. Plant second early and main crop potatoes; earth up early potatoes. April can be an even busier month than the last as it is usually now that the soil really begins to warm-up and becomes in a fit condition for cultivating and sowing. 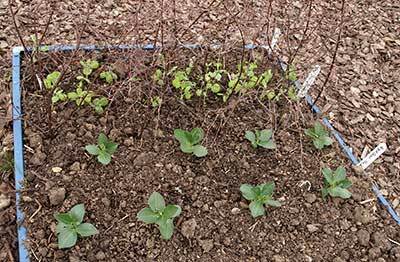 Broad beans and first early peas, sown in January and February, should now be showing through. Peas will need support as soon as the tendrils start to appear. The simplest and cheapest method is to push some twiggy sticks into the ground to form a mesh for the plants to grow up through (as shown left). Broad beans shouldn't need supporting. Keep on top of the hoeing whenever the weather permits. Half-an-hour with the hoe on a dry day will save hours of work later on. If weeds begin to grow in areas that are too wet to be hoed successfully, a thick mulch of garden compost or bark can be used to smother them. Even a sheet of black polythene works well or use sheets of newspaper that has been weighted down to stop it blowing about. If this fails you can always weed by hand. Continue succession sowing vegetable seeds in order to provide a steady supply of vegetables right through the summer and into autumn. Any of the seeds that were recommended for sowing in March can also be sown in April. These include: beetroot, carrots, turnips, leeks, radishes, spinach, Brussels sprouts, summer cabbage, lettuces, pickling and salad onions, peas, parsnips, broad beans, leeks, broccoli, cauliflower and various herbs. These vegetables can be sown directly in the ground to mature where they are. Remember to sow thinly in straight rows so that the resulting seedlings grow unimpeded and strongly. Alternatively they can be sown into individual small pots containing a seed or multipurpose compost and planted-up in their final positions later. If you haven't already done so, now is the time to sow ridge cucumbers and pumpkins under glass. In addition, many half-hardies, such as, runner beans, French beans, celery, courgettes and marrows may be sown under cloches or polythene tunnels towards the end of April. You can sow seeds of sweetcorn under glass now, but use organic pots that can be planted straight into the ground, as sweetcorn is notoriously difficult to transplant. Main crop potatoes should be planted in drills 10-13 cm (4-5 in) deep, allowing 40 cm (16 in) between tubers and 70 cm (28 in) between rows. Don't be tempted to grow too many main crop potatoes if space is limited. They take up a lot of room and can be bought quite cheaply in season. Ideally you should concentrate on the more expensive or less easily found types of vegetable. Tomatoes sown in a heated greenhouse are now ready for transplanting. Transfer to greenhouse soil, plant up separately in 23 cm (9 in) pots or growing-bags; or use ring culture, planting in bottomless pots on free-draining pebbles or aggregate. The plants should be 15 to 20 cm (6-9 in) tall, with first flower buds just opening. Space them 45 cm (18 in) apart and water before and after planting. Keep them moist and apply a liquid feed regularly. Tomato plants need support. In a deep soil bed, tie them loosely to canes. Otherwise, tie a soft string under the first truss and attach it to a wire running horizontally above the plants. Twist the stems gently around the string as they grow. The first shoots of asparagus can be harvested now. Broccoli (netting can be used to provide protection against pigeons). Lettuces sown in frames last October should be approaching maturity, if the weather is mild. Over-wintered chard can still be harvested in mild areas. Radicchio is actually a perennial which can regrow each year. Main crop vegetables such as Scorzonera can be sown now. Don't let any of last year's vegetables spoil by leaving them in the ground, once they are past their best they will probably only deteriorate.